I love spray paint! Yes, love it! Years ago we were pretty limited by color choices and what kinds of things we could use it for. Now, however, you can get spray paint to use on most anything you can think of. Plastics, wood, cement, rubber, metal, appliances, rocks…you name it and there’s a spray paint for it. Besides that, the color choices are amazing and include metallics, which are a lot of fun. When Jack and I moved into our home here, there were many things that we brought with us or that were already here that were perfectly good, but were in colors that didn’t work for us. We liked the style of them but the colors weren’t compatible with the look we were going for. It would have been simple to replace all of these things, but that’s not always the best thing to do. Jack and I both enjoy finding “creative solutions” to things around the house and we knew there was no need to throw away and buy new items when a simple answer to the problem was spray paint. From a French Provincial (off white and gold) light fixture to a chrome in-the-wall mount toilet paper holder, we were able to make them work with a little time and spray paint. To look at them now you would never know that their current colors aren’t original. 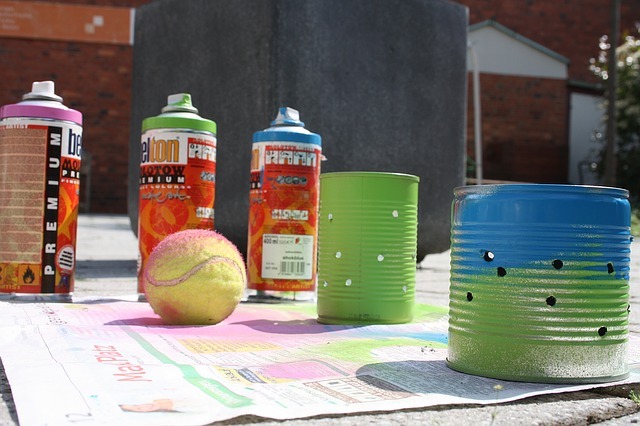 Before you get rid of things that you think “don’t match” or “don’t work” for your home, consider upgrading them with a simple can of spray paint. Our Cripple Creek & Florissant Ace Hardware & Supply stores have a great selection of types, colors, and finishes to choose from. You’ll find that you’re able to have something “new” without spending a lot for it and you’ll be happy with the outcome.